The most exceptional cruises in the most beautiful boat. There are legends where the beauty, perfection and attraction have travelled down the years with carefree grace and lightness. The Hacker-Craft is the perfect example. This mythic boat with its timeless elegance, a nautical jewel of chrome and mahogany, invites you on a magnificent sail on the most romantic of rivers. On board, time seems to stand still. 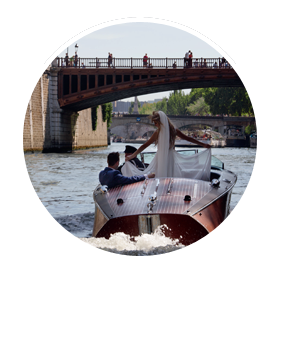 In his uniform, the Parinaute takes you travelling along the river whose embankments are home to some of the most famous landmarks and monuments in the world. Voguer, dream, admire, contemplate…. The magic operates wherever you look. You have an original view of the amazing architecture of The City Of Light. Sequana watches over the river. The river has its source in Source-Seine, in a valley on the plain of Langres in Burgundy. According to Gallic mythology, it is there that the nymph Sequana, represented in the form of a young girl standing upright in a boat, keeps her vigil. Statues found all along the course of the Seine River are witnesses to this belief along with two temples built at the Fortes Sequena (source of the Seine) bythe Lingons. Pilgrims hoping for a cure to their sickness or wanting to make a wish, laid offerings to the goddess. We can imagine that she still offers her protection to all those who navigate the Seine River. The purity and elegance of its lines hasn’t changed over the years. The luxurious leather and mahogany, the gold signature on its side, all done by master craftsmen. The Hacker-Craft of the Parinautes is a master-piece. Conceived by John L Hacker at the dawn of the XXth century, this “runabout” was originally a sports boat, holder of numerous speed records while ensuring a unique experience for leisure use. It was much sought after by the high society of the East coast of the USA who had holiday homes on the Great Lakes. 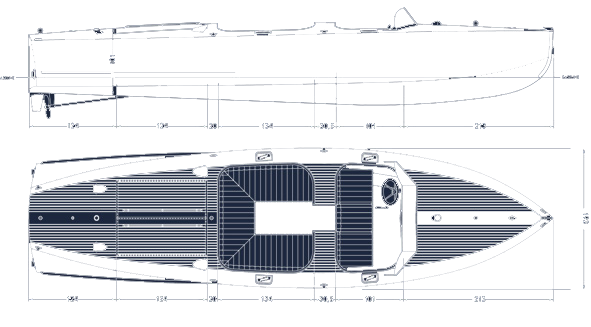 It is a model that inspired other boat builders, such as the famous Italian, Carlo Riva and the American Christopher Columbus Smith, founder of the Chris-Craft. 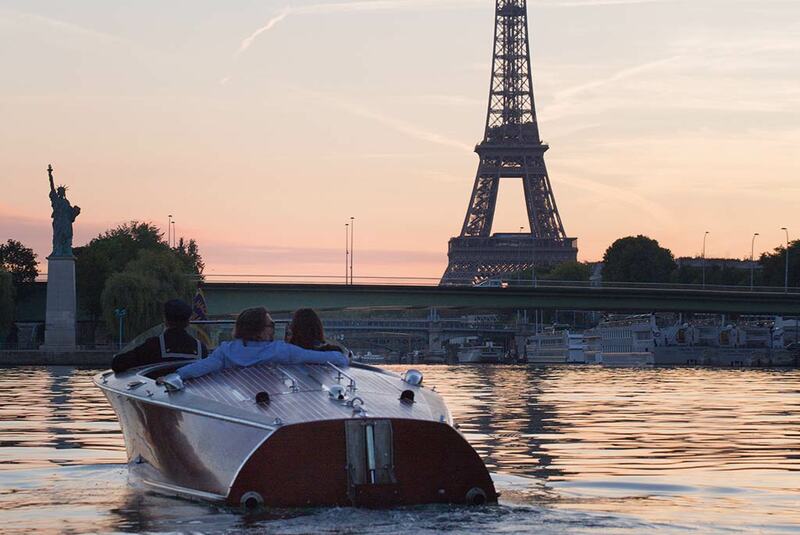 Today, on the Seine, our Hacker-Craft, baptized “Hortense”, combines the best of the past and the future. Its hybrid engine means no noise to spoil your enjoyment of your sail along the river. Sublime, it leaves in its wake a perfectly forged souvenir. From Aristotle Onassis to Tommy Hilfiger, Errol Flynn and Humphry Bogart, many celebrities made the Hacker-Craft their boat of leisure. 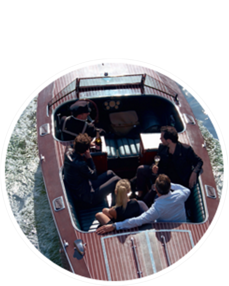 The boat has featured in many Hollywood films such as, A Place in the Sun or The House on the Lake….. Welcome on board a legend. Navigating on the Seine and also via other rivers, the Nautes of Lutece commerced with the antique world. It is their spirit of travel, discovery and quality that is the inspiration behind today’s Parinautes wish to guide you for your pleasure. The boats of the Nautes ; a symbol that has endured the centuries. The coat of arms depicts a silver boat on a silver sea, under a blue rectangle adorned with numerous golden lilies and topped by a crown of a walled city with towers, supported on either side by a branch of oak and a branch of laurel. This is well and truly the boat, symbol of the Corporation of Nautes that gave birth to the city of Paris, which is still present on the Coat of Arms of Paris. This symbol dates from the Gallo- Romain era and Saint Louis, King of France was the first to recognise it. 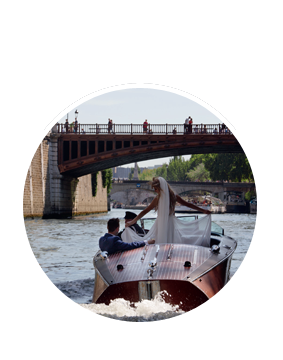 The Seine is a sumptuous avenue which allows us to admire the very heart of Paris. It gives an unusual and privileged view of the most iconic sites ; The Eiffel Tower, the Alexander 111 Bridge, Notre Dame and the Island of Saint Louis. Seeing these iconic sites of the capital from a Hacker-Craft, spiced with the many anecdotes of the pilot, make it a unique experience. Depending on your desires or interests it is possible to make stops to better appreciate the wonders of Paris close-up. If you enjoy speed; the Hacker-Craft is authorized to give its full power along length of the Bois de Boulogne and the road taken by King Louis X1V to join Versailles. At more than 35 knots (65mph) it is a simply exhilarating experience. Navigating on the Seine River allows us to stop off close to the major monuments of the city. But, our idea of “tailor-made” goes further than that. A catering service can be proposed. The most renowned restaurants, chefs and master-bakers will bring their exceptional dishes to be savoured on board the Hacker-Craft. And, although you are always served a glass of Champagne, have no hesitation in communicating your desires ,or those of your partner or friends. Your pleasure is our pleasure and the Parinautes will do all in their power to fulfill your wishes. We Parinautes, pilots of your cruise, know the Seine River by heart. Its secrets, hidden treasures, moods and surprises that only experienced pilots can deliver. In osmose with the river their sole aim is to provide rare and magical moments that will be engraved in your memory. If the boats of the Parinautes are dedicated primarily to cruises it is possible to hire the Hacker-Craft for the shooting of films or advertising. The emotion is guaranteed. 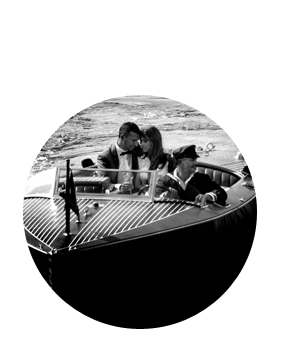 Experience a special cruise on your special day. Say “yes” to these romantic moments and enjoy your wedding day in a sublime setting. All possibilities to personalize the cruise are open to give a moment that is truly yours. As such, you may even have a cortege of boats to follow and share your wedding cruise with your guests. On the Seine, the Parinautes wish you all the happiness in the world. 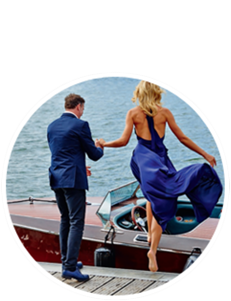 A cruise made to measure for your wedding day, you will keep the memories alive. Professional photographers, whose presence is undetectable, are posted the length of the cruise at strategic points on the bridges to “steal” natural photographs. The high quality photos bear witness to your unforgettable day. Of course, the reglementation of navigation is primordial. To offset adverse weather conditions the Hacker-Craft is equipped with an awning. However, the people responsible for navigation may impose safety measures in the case of force major that are beyond our control and may cancel navigation or order restrictions on the Seine.